Details:	The longest bridge in Asia at 5525 meter, it comprises 45 spans of 121 meter each and 2 end spans of 63.5 meter each. 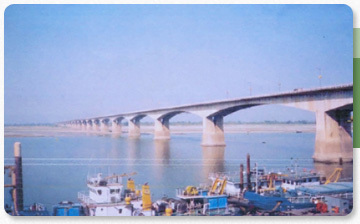 It is a prestressed concrete bridge with pre-cast double cantilever construction on RCC piers and wells. The superstructure consists of cantilever "T" arms of 60 meter each on each side of the pier. Challenge: On account of proximity to the saline environment the existing prestressed cables were corroded resulting in loss of prestressing forces and deflection of the cantilever arms. Due to distresses some of the segments were forming a gap of 15 to 20 mm. Cracks were observed in the bottom slab of the segment cast box girders in a few spans, and excessive sagging of cantilevers was also observed. 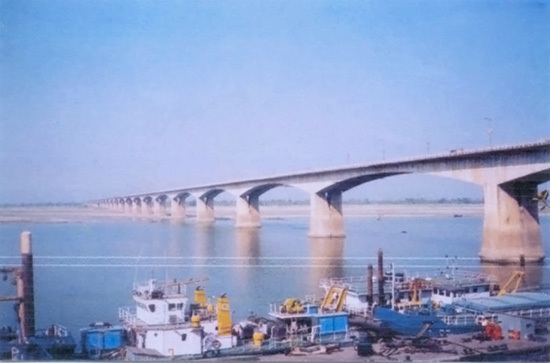 Solution:	The rehabilitation of the bridge was carried out by external prestressing to the deflected cantilever tips and spans, and stitching was done with imported Macalloy bars. The damaged central hinge bearings and expansion joints were replaced with new ones.